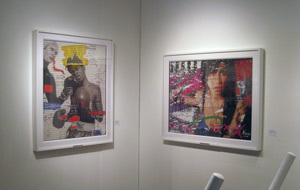 The 18th annual LA Art Show, presented by the Palm Beach Show Group, was held from January 23-27, showcasing works by over 100 prominent galleries from the world. 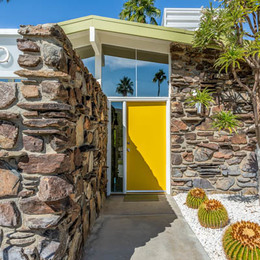 Featuring four sections: Modern and Contemporary section, Historic and Traditional Contemporary section, Vintage Poster section and the Los Angeles IFPDA Fine Print Fair section, this showcased a wide variety of artistic sensibilities. 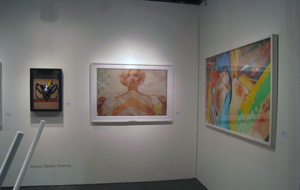 Modern and Contemporary Section: This section features vibrant and exciting works from today’s great artists and visionaries. From performance pieces to mixed media and video installations, as well as photography, paintings and sculptures and a series of curated exhibits, the list of high-quality works is extraordinary. Historic and Traditional Contemporary Section: The show provides collectors the opportunity to purchase and view rare examples of historic works from 18th century European to contemporary realism and California plein air to the Hudson River School. Featuring works of masters such as Degas, Picasso, Dali, Rodin, Van Gough, Jan van Beers and Jules Dupre, these works represent major artistic points throughout history. The Los Angeles IFPDA Fine Print Fair: As one of the longest running print fairs in the United State, this fair brings art dealers who are members of the International Fine Print Dealer Association. The IFPDA is dedicated to promoting a greater understanding of printmaking, an artistic medium that has been around for over 500 years. Vintage Poster Section: The vintage poster is a long-loved genre of art, representing the hot topics of historic times, catching the viewer’s eye on art, politics and commerce. 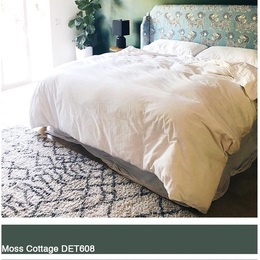 Styles include Art Nouveau, Art Deco, and Mid-century Modern. Walking the show provided real glimpses into the genius of these artistic masters and kept going back to view the modern and contemporary section. 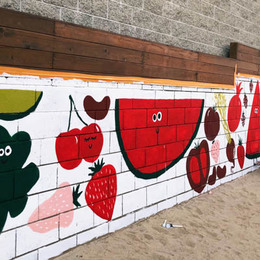 With bold splashes of color, a whimsical sense of humor in many of the works, a sense of history and great back stories of the artists who created these works, here are our highlights. 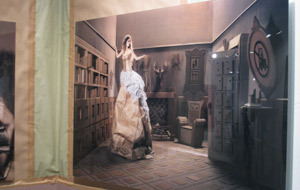 Using recycled materials, photographer Cristobal re-used these materials to construct luxury atmospheres. 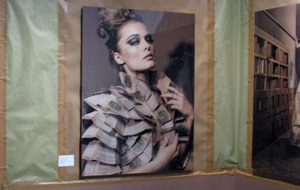 With a subtle wink to the message of consumerism, his use of metallic paper elevates the photography to a chic and glamorous series of portrait settings. 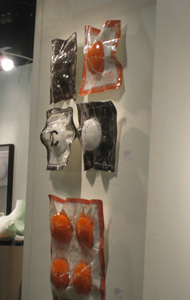 All works by this artist caught our attention. Starting as a street artist, his work grew into a sophisticated and satirical comment on the idea of addiction on many levels. 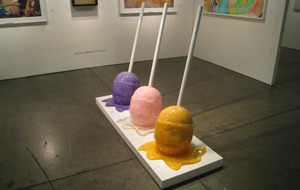 From his designer drug series to a sculpture of three colorful suckers, Desire Obtain Cherish has risen to cult-like status. 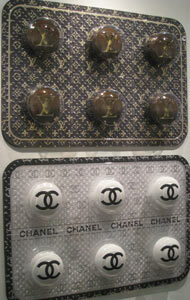 Works below include Grape Meltdown, Pink Champagne Meltdown, Basquiat Punched, Designer Drug Soft Pill Packs, Designer Drugs Louis Vuitton, Marilyn Unveiled and Designer Drugs Chanel. 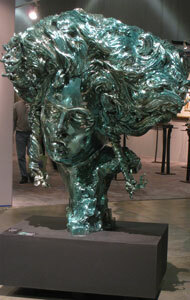 To see more of his work, check out The McLoughlin Gallery. Tilt, recognized internationally as a graffiti artist,developed his artistic style in the 1980s as a youth on the streets of Toulouse, France. His work emphasizes primitive lettering and complicated 3D wild characters with strong color and high impact shapes. His paintings focus on stylized versions of various sayings and names, placed as "throw-up" bubble letters. "Throw-ups" allow graffiti artists to quickly lay down art. Currently, the Fabien Castanier Gallery is showcasing a solo exhibition by Tilt called All You Can Eat, a reflection of American appetites. 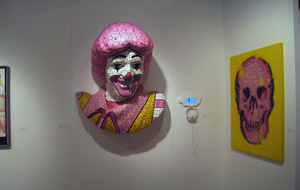 On display at the LA Art Show: Walking on Mushrooms, Ronald Loves Vanilla Milkshake, and Endless Obsession. 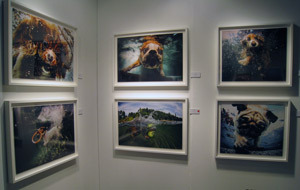 Photographer Seth Casteel is an award-winning artist and New York Times Best Selling author. 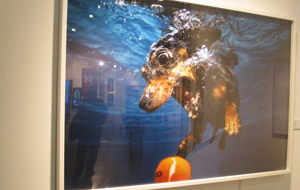 With his work series Underwater Dogs, he has become world-renowned and these images have become some of the most widely famous images of the last decade. Known for his efforts in the animal rescue community, he has been recognized in TIME magazine, The Today Show and The Humane Society. Personally, we award him for the absolute delight and smile his work puts on our faces every time we see his work. The Latin American Masters Gallery for Modern and Contemporary Latin American Art focuses on artistic works from mid-career to masters artists including Olga de Almaral from Columbia, Arnaldo Roche from Puerto Rico, and Francisco Toledo from Mexico. Jenise Ramos, Assistant Director of the gallery, showcased some of the highlights of these artistic geniuses. Francisco Toledo, widely considered Mexico’s greatest living artist, has an impressive array of talent which spans a variety of disciplines including printmaking, drafting, painting, sculpting and ceramics. On display, his works showcase his love of nature, in particular many insects and animals that aren't usually thought of as beautiful and his vision of proving that the world of humans and nature are one. His creations are fantastical hybrid creatures, part human and part animal. 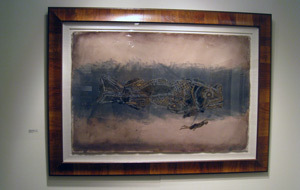 The work here Fish with Swimmer is a creation of handcut mica and watercolor in soft, muted coloring, displaying his vision of a new nature. 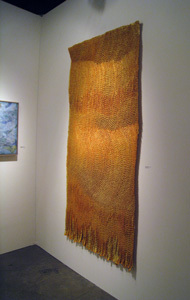 Olga de Almaral, a world-renowned Columbian textile artist, transforms two-dimensional textiles into three-dimensional works of art through the use of gesso, fiber, paint and precious metals. Her work is widely exhibited in museums such as the Museum of Modern Art, New York, the Museum of Modern Art, Kyoto, Japan and Musee de Art Moderne de la Ville de Paris, Paris, France. 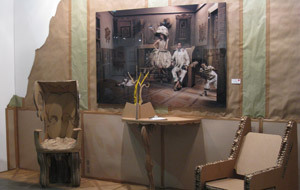 Her use of gold, inspired by the pre-Hispanic and Colonial intertwined histories, provides a unique and sensual, otherworldly presence. 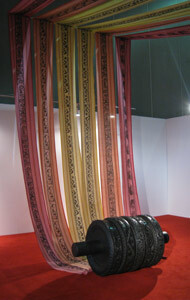 The featured work here Umbra 46, dated 2005, is a creation of fiber, acrylic and gold leaf. Stunning! Park Sung Tae is a renowned artist in South Korea who began his artistic career painting portraits, and working in clay and ceramics. Realizing the heaviness of these materials as many works were destroyed upon transport to final destinations such as Germany, he began experimenting with lighter materials such as recycled aluminum screens, cut to focus on the light and shadow effects of objects. 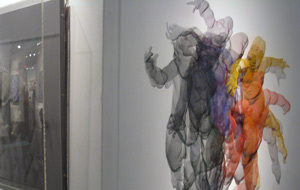 With a play on dimension and space, Park Sung Tae experiments with exaggerated muscle formations and contours, and his expertise with the human and animal form is clearly shown in the nuances of the aluminum bents and formations. And with subtle sprays of color on the aluminum to further provide depth of character, his works display a lifetime of commitment to understanding this dimension and spaces. 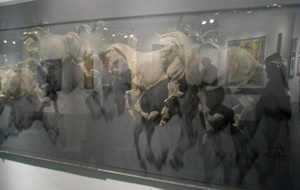 On display: Untitled, mixed media human forms; Untitled, mixed media horse forms. 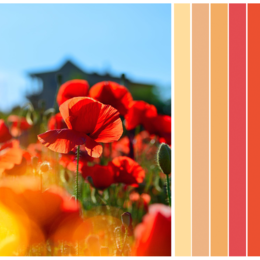 The ADC Contemporary Art Gallery & Building Bridges International Art Exchange is a non-profit organization dedicated to strengthening and cultivating international cultural relations and engaging local communities through art programs. 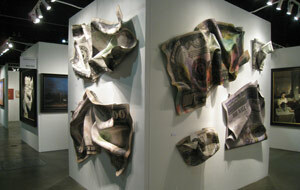 This platform provides new and emerging artists support, information and opportunities for exhibiting and exposure. Born in Mexico City, where she lives and works, Betsabee studied communications, fine arts and art history in Mexico and France. 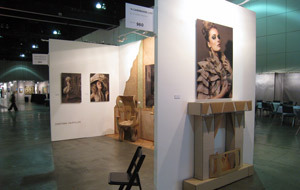 As an internationally renowned artist, she has participated in numerous shows throughout Latin America, Mexico, the United States and Europe. 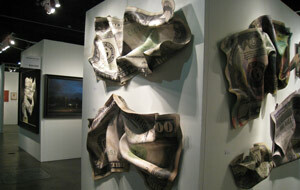 Betsabee Romero's work showcases the contemporary street scene. From tire tracks imprinted on cloth to idealize the depths of urban life and migratory aspects of culture to prints made on car hoods and even toy cars, these works depict her vision of human behavior.